The Tacoma Digital Connectors and Friends: If you've a sharp eye, you'll spot Congressmen Norm Dicks and Adam Smith, and Tacoma Mayor Marilyn Strickland, there to congratulate the youth for their accomplishments. There were a lot of smiles Monday as we celebrated the graduation of the first Comcast Digital Connectors class in Tacoma at The Evergreen State College – Tacoma: Nine youth from the Hilltop and other parts of Tacoma who’ve stuck with the program and develop great skills in digital literacy. This is a great video that was assembled by Katelin Chow, a University of Washington student who is an intern in the Comcast Washington communication office this summer. You’ll see, among others, Congressman Norm Dicks, Tacoma Mayor Marilyn Strickland, Bill Black of the Comcast Foundation, Dorothy Anderson of the Tacoma Urban League, Ron Edwards of One Economy. Pictures from the event by Lakewood photographer Ed Kane were uploaded Monday almost as they were being taken: you can see the pictures of Monday’s event here. There’s another video of the students available, one made in advance of the ceremony, as you might have seen in the post below. Here is the full, and we do mean full, news release. It’s long, but we think these youth are important so we didn’t mince words. And the release also has info about the partners involved. There’s more multimedia to come: Comcast Newsmakers segments shot on location. We’ll post those within the next few days. TACOMA, Wash., Aug. 16 /PRNewswire-FirstCall/ — Comcast, Tacoma Urban League and One Economy today celebrated the success of a major technology learning and service initiative that teaches young people about broadband technologies and how to put that knowledge to work to serve the Pierce County community. The program, Comcast Digital Connectors, was conducted during the 2009-2010 school year by the Tacoma Urban League in cooperation with The Evergreen State College – Tacoma and will continue next fall throughout the academic year. In the Comcast Digital Connectors program, nine Tacoma high school students from diverse and low-income backgrounds were selected to gather two afternoons a week throughout the year to learn digital literacy skills. The young people then volunteered their time at community-based organizations, senior centers, religious-based organizations and even in their own homes to help improve digital literacy. 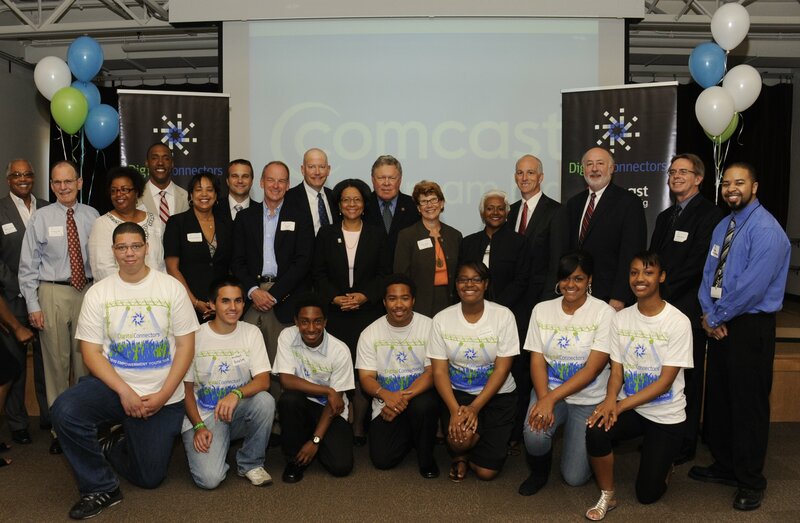 A number of community leaders joined Comcast to celebrate the program’s success, including U.S. Congressmen Norm Dicks and Adam Smith, Tacoma Mayor Marilyn Strickland, and others. 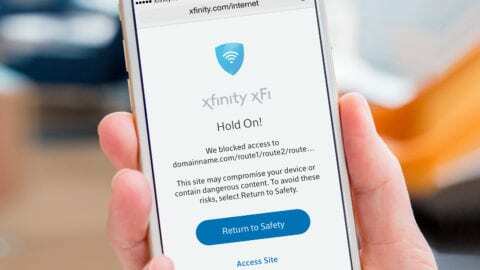 As the nation’s largest residential Internet service provider, Comcast is contributing to One Economy’s mission to maximize the potential of technology in cities and towns across the country. 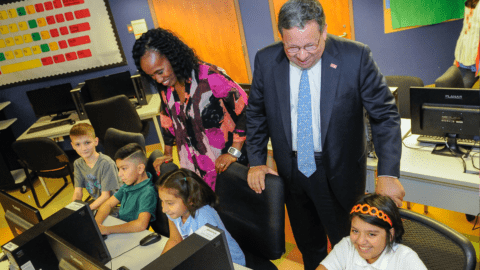 Comcast’s commitment to the Digital Connectors initiative, developed in 2001, will also help One Economy increase the number of youth who will benefit from the program. To date, nearly 3,000 young people have contributed more than 77,000 hours of community service through the Digital Connectors initiative. The One Economy-Comcast partnership aims to double the number of participants in the program and the hours of service they contribute to their communities. The curriculum for Comcast Digital Connectors covers several broad areas to help the program participants learn real world applications for broadband technology. Modules include leadership principles, real world learning opportunities, digital technology skills development, community service, financial literacy and civic journalism. The students learned how to network computer labs, connect wireless access points and create video documentaries. Additionally, they were given instruction in entrepreneurship, healthy living, career and character development. The program also included creative media projects intended to inspire the Digital Connectors to put broadband and Internet technology to their greatest use. This is the first such location in Washington for this nationwide program; there will be several sites in Seattle next academic year. The program was coordinated by the Tacoma Urban League, and held in the media lab at Evergreen. In addition to Tacoma, the Comcast Digital Connectors program has already launched in Washington, D.C.; Denver, Colorado; Houston, Texas; Springfield, Massachusetts; Dearborn, Michigan; Morgantown, West Virginia; Modesto, California; Burlington, Vermont; and Tallahassee, Miami and Palm Beach, Florida. Other sites expected to kick off by the end of 2010 include: Atlanta, Georgia; Chicago, Illinois; Philadelphia and Pittsburgh, Pennsylvania; Portland, Oregon; Salt Lake City, Utah; and Twin Cities, Minnesota. Comcast powers dreams in the communities it serves by providing access to innovative technology, volunteering time, giving financial support and partnering with organizations to make communities stronger. The company focuses its community investment initiatives on building tomorrow’s leaders, promoting community service and expanding digital literacy. Since 2001, Comcast have provided $1.8 billion in cash and in-kind support to national and local non-profit organizations in 39 states and Washington D.C. The company has made a $1.2 million commitment to sponsor the Digital Connectors program for three years, beginning in 2009. Comcast Corporation (Nasdaq: CMCSA, CMCSK) (www.comcast.com) is one of the nation’s leading providers of entertainment, information and communication products and services. With 23.2 million cable customers, 16.4 million high-speed Internet customers and 8.1 million Comcast Digital Voice customers, Comcast is principally involved in the development, management and operation of cable systems and in the delivery of programming content. Comcast’s content networks and investments include E! Entertainment Television, Style Network, Golf Channel, VERSUS, G4, PBS KIDS Sprout, TV One, 11 regional sports networks operated by Comcast Sports Group and Comcast Interactive Media, which develops and operates Comcast’s Internet businesses, including Comcast.net (www.comcast.net). 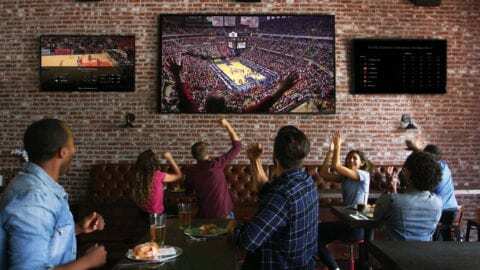 Comcast also has a majority ownership in Comcast-Spectacor, which owns two professional sports teams, the Philadelphia 76ers NBA basketball team and the Philadelphia Flyers NHL hockey team, and a large, multipurpose arena in Philadelphia, the Wachovia Center, and manages other facilities for sporting events, concerts and other events. Comcast’s Washington Market serves more than 1.1 million customers statewide and employs approximately 3,000 people. Comcast has three major call centers located in the state. The Comcast Foundation was founded by Comcast Corporation in June 1999 to provide charitable support to qualified non-profit organizations. The Foundation primarily invests in programs intended to have a positive, sustainable impact on their communities. The Foundation’s focus areas are expanding digital literacy, building tomorrow’s leaders and promoting community service. Since its inception, the Comcast Foundation has donated more than $77 million to organizations in the communities nationwide that Comcast serves. More information about the Foundation and its programs is available at www.comcast.com/inthecommunity. One Economy is a global nonprofit organization that uses innovative approaches to deliver the power of technology and information to low-income people. More than 17 million people have used One Economy’s online tools and resources, including the Public Internet Channel (www.pic.tv), to build better lives. One Economy has launched on-the-ground programs in 42 U.S. states, Africa, Europe, Latin America and the Middle East. The Digital Connectors program is One Economy’s flagship initiative that delivers 21st century technology training to young people from low-income backgrounds, who then share what they learn within their own communities. To date, more than 3,000 Digital Connectors have delivered more than 56,000 hours of technology focused community service. Learn more at www.one-economy.com. Founded in 1968, the Tacoma Urban League is devoted to empowering African Americans and other disenfranchised groups to enter the economic and social mainstream. For over 42 years, the organization has stood for programs that promote self-sufficiency, educational and health equity, and economic empowerment. The Tacoma Urban League continues to provide volunteer opportunities for those who are eager to get involved and become a part of the service tradition that has defined our community and our movement. The Evergreen State College – Tacoma program is committed to providing junior and senior-level students with an interdisciplinary, reality-based, community-responsive liberal arts education. The unique inner-city location combined with a curriculum that integrates students’ life experiences and goals with an emphasis on diverse cultural perspectives provides a unique opportunity for students to go into local communities and engage in research, education and problem-solving projects that are as beneficial to those communities as they are to students.